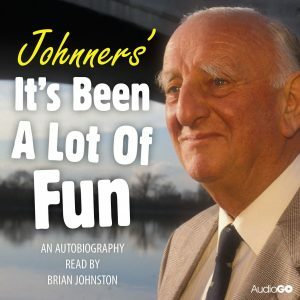 Now available for the first time on CD and as an audio download, in this delightful reading from his autobiography It’s Been a Lot of Fun, Brian Johnston recalls his schooldays at Eton and Oxford, his early career in the family coffee business, and his service as a Technical Adjutant in the Grenadier Guards during World War II. In January 1946, Brian joined the BBC Outside Broadcasts Department. For the next 48 years, he presented hundreds of programmes on radio and television, from In Town Tonight to royal weddings and Down Your Way, but he was probably best known as a cricket commentator and he became a national institution on Test Match Special. Recorded in 1990 when he was 77, Brian tells some of his favourite stories and gaffes in this cheerful look back at a unique career behind the microphone, a life full of lucky breaks and private disappointments, but always a lot of fun. Edited and digitally remastered by Barry Johnston, this is the fascinating autobiography of a legendary cricketing commentator.